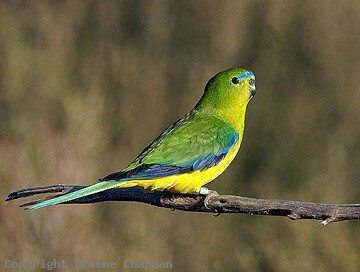 There are just over 580 species of birds we can call our own - that is birds that breed in Australia - and Orange-bellied Parrots are probably the most endangered of these. Current estimates are in the order of only 200 birds. 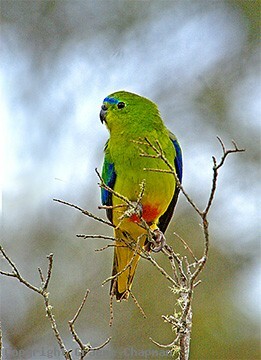 Sadly, the only species to have become extinct in recent times is another parrot, the Paradise Parrot. 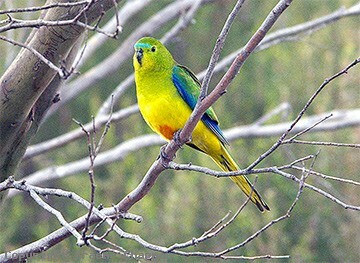 Back in the 1830s John Gould recorded Orange-bellied Parrots near Hobart and also on islands in the D'Entrecasteaux Channel in SE Tasmania. 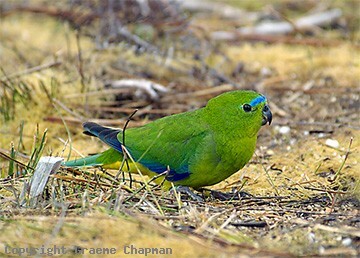 Since then their range has gradually contracted, no doubt the result of development of eastern regions of Tasmania and also their coastal wintering grounds on the mainland. OBP's spend the summer and breed on the remote west coast of Tasmania, but in winter, they migrate north across Bass Strait to coastal regions of Victoria and SE South Australia, no mean feat for such a small bird. One of the most intensive research and recovery programmes ever directed at an Australian bird is currently in progress. 305201-D ... Orange-bellied Parrot, Melaleuca, Tasmania, Nov. 2008. Copyright © 2005-2016 Graeme Chapman. All rights reserved.